And in the early hours of last Monday morning, I wrote THE END. I love this book; I can’t say I love it more than The Grace of Kings, even though it probably is better in many ways—but your first book is special. Writing this book was a completely different experience from The Grace of Kings. For TGOK, I had years and years; for the sequel, I had only one year. The first draft of TGOK was pretty much finished in a single month; the sequel was composed in tiny chunks on the commuter rail over many months—ah, the edits that I had to go through. TGOK’s plot was determined early on; the sequel asked me to explore and write and explore—and then, just when I thought I was close to being done, the book lurched in a different direction. And I wrote about 100,000 words in four weeks. A completely unexpected direction, but wow, so much better. The revisions will come next, as well as copyedits for The Paper Menagerie and Other Stories, translations and short fiction commissions, and many other looming deadlines I’ve been neglecting. But for now, I’m going to enjoy the feeling of a finished draft. 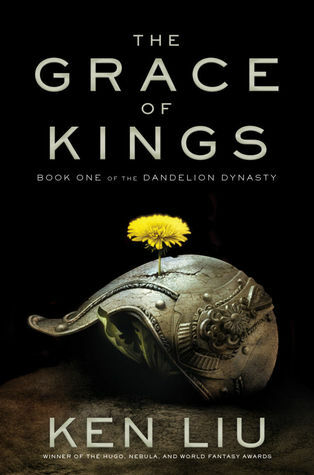 The Grace of Kings will be officially released on 4/7, but some book stores already have copies on shelves, and Barnes & Noble has already started to ship online orders. Here’s a round-up of some early reader reactions, updated over time. First, I’m going to do something unusual by linking you to two articles that are not labeled as reviews. But I think they tell you something important about why The Grace of Kings feels different from other epic fantasy. The writers comment on what I’m trying to do with this book. Next, reviews! This isn’t meant to be comprehensive. I’ve purposefully chosen to focus on reviews that delve deeper into why the book worked (and sometimes didn’t work) for the reader. Kate Elliott, A Dribble of Ink: This isn’t a traditional review as such. Rather, Elliott asks interesting questions about the novel — filled with spoilers though. Ana Grilo, The Book Smugglers: The review notes many things the book does well, as well as disappointment with the way women characters are handled in the early parts of the book. You can also look on Goodreads for more reviews. I have shiny copies of the ARC of The Grace of Kings! And so of course I’m going to run a Goodreads giveaway for two signed copies. Thank you for your interest! Every awards season, I do one post to recommend other people’s stories and list out my own eligible work. You can find this year’s iteration here. It’s important for everyone to recommend stories they enjoyed; it’s the best way to make sure good work is recognized. It’s also important for writers to promote their own work; it’s the only way for others to find out what they’ve done. From today to January 31, I’m doing a Goodreads giveaway of two copies my novel. Now, these are not the final books — rather, they’re bound copies of the uncorrected/unproofed manuscript. But it looks like a book; it reads like a book; it’s as heavy as a book. I’ll personalize the copies and include a copy of the map I drew myself for it (very rare!). Here’s the link to enter. Good luck! Research for Book 2 of the Dandelion Dynasty. If you know what these are, you’ll have a hint of what’s coming. I hope you have as much fun reading this as I’ve been having writing it. And yes, the shocks do hurt.